Slots Capital Casino is one of the latest Rival casinos to accept US players! Cashable Slots Bonuses up to $2777! Low 20x Wagering. Play with a $7 FREE No Deposit Bonus on the house! accept US players and players from most countries including the UK. Claim some generous real money slot bonuses when joining any of our recommended Rival Casinos. Play over 150 slot and table games. US Players can deposit with Visa, Mastercard, American Express and prepaid debit, credit & gift cards. Uk and European players can deposit with Visa Electron, Maestro, Ukash, Click2Pay, Eco Card, Neteller, Moneybookers/Skrill. Check with casino live help for the best deposit and withdrawal methods for your location before playing. For online gamblers that like to wager on the most recent slot games some of the newer Rival 5 Reel Bonus Slots you can play are Scary Rich 3D, Mystic Wolf, Coins of Olympus, Cavalier Cash, Crazy Camel Cash Gushers Gold, A Day at the Derby. Opera Night and Itchin 2 Win. All fun slots. Some player favorites include the original Scary Rich, Scary Rich 2, Travel Bug, Jacques Pot, Western Wildness, Reel of Fortune, Ocean Treasure, Watch the Birdie, Hobos Hoard and one of the first Rival bonus slots, Cleopatras Coins. Rival offer players a choice of installing the full casino or playing the flash version. To play any of the Rival Casino slots for free or real simple select from our Recommended Rival Casinos below or start playing right away with a $10 Free No Deposit Bonus when you register as a real player at Desert Nights Casino. Plus you can play the Desert Nights exclusive Rival slot game Blazing Buffalo. The casino fun at Rival doesn't stop with bonus slots or progressive slots. All the Rival Casinos include interactive bonus slots, coined i-slots. These interactive slots, combine the fun of playing a classic slot with the thrill of a bonus slot. Each i-slot reveal a unique story during your playing session. At the start of each slot game is a short animated video clip introducing the slot games characters. As you play, completing more levels, you're awarded with mini bonus rounds and entertaining animations. Some i-slot bonus slot games include, Baby Boomers: Cash Cruise, Cosmic Quest: Mission Control, Cosmic Quest Episode 2 - Mystery Planets, Hole in Won, As the Reels Turn: Episodes 1, 2 and 3 and Reel Crime and Reel Crime 2: Art Heist. All the Rival Casinos also offer players classic 3 reel slots, Blackjack, Video Poker, Roulette, Keno and Jackpot Keno and scratch cards. The Rival casino lobby is easy to navigate and the casino install quickly. Our recommended Rival Casinos accept most US players and most non-USA players with tons of free bonus cash. If you like playing for mega-jackpots, the Rival Casino brands offer players the chance to win big jackpots when playing the progressive jackpot slots Money Magic, Major Moolah, Million Reels B C and Strike Gold. • Slots Capital Casino - Get $2777 in Free Casino Bonuses! Claim a $7 Free No Deposit bonus when joining. The $2777 slots bonus works like this: Claim 200% on your first deposit up to $1,000. Claim 105% up to $1,050 on your second deposit. Claim 70% up to $720 on your third deposit. There is no NO MAX Cash Out on this bonus offer. The bonus money is cashable and can be withdrawn with winnings. Wagering is 20x deposit plus bonus on slots. Slots Capital Casino welcomes players from USA, AU, UK and Europe but not Canada. Read the bonus terms before claiming. Slots by Rival Gaming. Slots Capital Casino is the sister casino of Desert Nights Casino and players can claim both casino bonuses. Visit Slots Capital Casino to claim bonuses or read more. • Desert Nights Casino - Get $10K in total Free Money Bonuses! New players can claim up to 10 slots only deposit bonuses when joining. The bonus offer works like this. You can claim three 100% matching bonuses and seven 50% matching deposit bonuses. Each bonus can be up to $1,000 each depending on the size of your deposit. Deposits 1,5 and 10 award a 100% match while the rest award a 50% match. Read the bonus terms before claiming. Desert Nights Casino accepts both credit, debit and prepaid visa and mastercards for making deposits and also offers players a 15% bonus incentive if they deposit using one of these alternate deposit methods: NETeller, Ukash, iDeal, Moneybookers/Skrill, EcoCard, Quickcash and UseMyBank. 24/7 live help and toll-free telephone support. Visit Desert Nights Casino to play fun Rival slots. 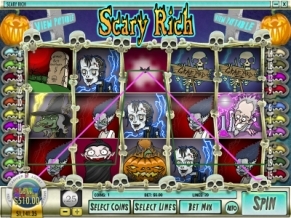 In this fun Rival slot game, mummys, pumpkins, witches, grave yard skeletons and other erie creatures make up the reel set. A Frankenstein scatter symbol triggers the free spin bonus round and a Vampire wild symbol substitutes for all symbols except the Frankenstein scatter. Three or more Frankenstein scatter symbols stopping on any reels whether the payline is covered or not triggers a 10 free spin bonus round. During the free spin bonus round the Vampire wild symbol expands to complete winning multi-payline combinations. In addition the more expanding Vampire wilds you get the bigger the payoff. One expanding wild symbol multiply each payline win by 2x, while two wild symbols multiply your win by 3x and three wild symbols multiply your win by 4x. 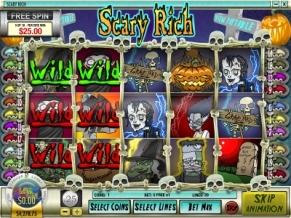 Best Rival Scary Rich Slot Features: The Scary Rich slot payback percentage is 96.79%. Multiple expanding Vampire wild symbols allow for some decent payline wins. 5 reels, 20 Paylines, wager from 1¢ to $2.50 per payline. Top prize is 10,000 coins! 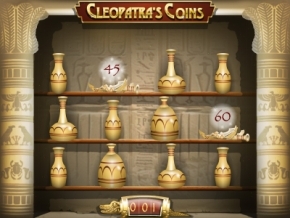 In the Rival slot game Cleopatras Coins you can win 10, 20 or even 100 free spins at 3 times your payline bet when you get 3 or more Poisonous Asp scatter symbols on any paylines. 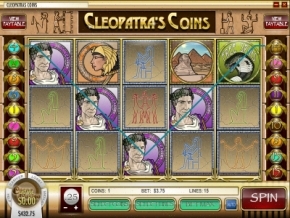 3 or more Cleoparta Coin scatter symbols on any paylines trigger the Urn bonus round. In the Urn bonus round you select 3 or more Urns to reveal your prize. The free spin bonus feature can be retriggered during the free spins and the Urn bonus round can be triggered during the free spins for additional wins. 5 reels, 15 Paylines, wager from 1¢ to $2.50 per payline. Best Rival Cleopatras Coins Slot Features: Top prize is a whopping $50,000 and players can win $1250 just by playing 5 nickels per pay-line. Scatter wins are multiplied by the total bet and not the number of coins. Visit Slots Capital Casino to play fun Rival Slots! See all the Different Slots you can play in our Recommended Online Casinos.